Tropical Cyclone Winston raked across Fiji Saturday with Category 5 winds, the strongest landfalling tropical cyclone on record in the South Pacific archipelago. 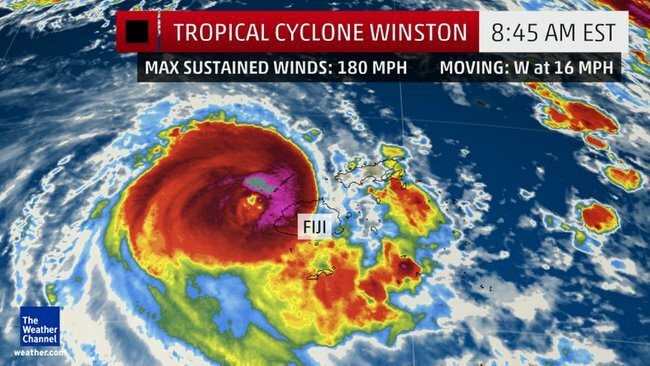 According to the U.S. Joint Typhoon Warning Center (JTWC), Winston made landfall along the north coast of Fiji's largest, most populous island, Viti Levu, Saturday evening, local time (Fiji is 17 hours ahead of U.S. Eastern standard time), packing estimated maximum sustained winds of 180 mph. 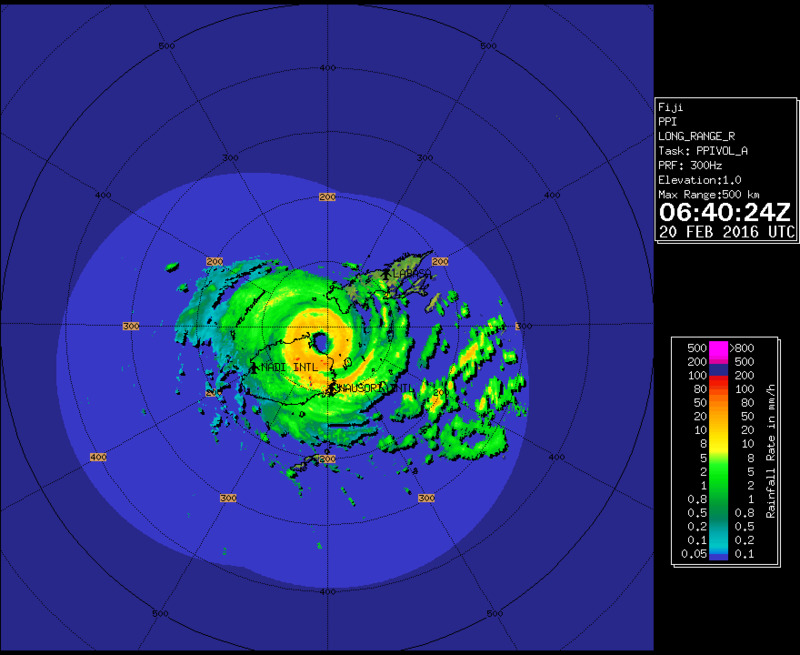 Winston not only was the first Category 5 tropical cyclone of record to hit Fiji, but earlier Saturday afternoon, became the strongest tropical cyclone of record in the Southern Hemisphere by maximum winds, peaking with 185 mph winds estimated by the JTWC, according to Colorado State University tropical scientist, Dr. Phil Klotzbach. The tropical cyclone's eye is now pulling away from Viti Levu, and conditions will slowly improve as Winston pulls westward out to sea, then bends to the south-southeast by Sunday and Monday, posing no further threat to other land areas. Winds at Nadi International Airport on the west coast of Viti Levu gusted to 82 mph Saturday night as the southern eyewall of Winston moved in. Earlier Saturday morning, as Winston's eyewall raked the eastern islands of Fiji, a 106 mph 10-minute sustained wind was clocked on Vanua Balavu Island before the station stopped reporting. Dating to 1979, only four other tropical cyclones of Category 4 intensity had tracked within 100 miles of Fiji's largest island, according to NOAA's historical hurricane tracks database. The last to do so with Tropical Cyclone Evan in mid-December 2012. The Weather Channel hurricane specialist, Michael Lowry, says there had been only 10 other Category 5 tropical cyclones in the South Pacific east of Australia since 1970. 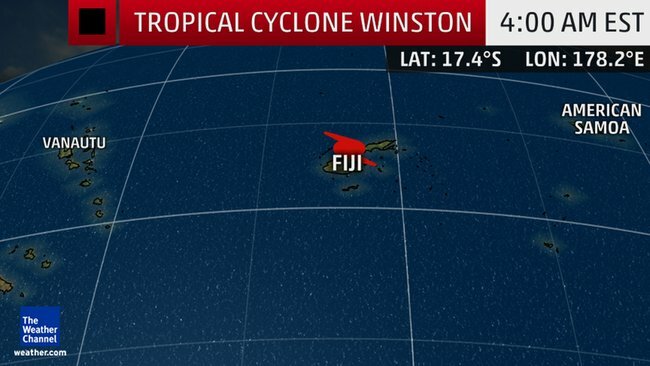 It's also fairly rare for any tropical cyclone to affect Fiji. According to NOAA's Historical Hurricane Tracks database, only 12 tropical cyclones of at least Category 1 equivalent intensity have tracked within 100 miles of Fiji's capital and largest city, Suva, since 1972. So far this century, an average of 5-6 tropical cyclones of at least tropical storm intensity have formed each year in the Southwest Pacific basin, much fewer than in the Atlantic, eastern Pacific, or western Pacific basins. This is the second year in a row a Category 5 storm has made landfall in the South Pacific. In March 2015, Tropical Cyclone Pam raked through Vanuatu with winds of 165 mph. The Fiji Meteorological Service estimated Winston's central pressure around 915 millibars during its Viti Levu landfall Saturday. While Pam's estimated winds were less, the FMS estimated Pam's central pressure dropped to 896 millibars on March 14, 2015. The most intense Southern Pacific tropical cyclone by estimated central pressure was from Tropical Cyclone Zoe on December 28, 2002, dipping to 890 millibars, according to the FMS. It's not often that a tropical system makes a U-turn and hits an area twice, but that's exactly what happened with this storm. The first strike on Tonga from Winston left damage behind. According to Matangi Tonga Online, trees and power lines were brought down and homes were damaged in Vava'u, but officials said they haven't confirmed any injuries from the storm's first pass. Hundreds of residents went into shelters during the storm, and hurricane-force wind gusts were reported on the island early Tuesday morning, Matangi Tonga Online also said. "We are thankful there has been no report of lives lost or injuries in all of the islands," Deputy Prime Minister Hon. Siaosi Sovaleni told Parliament. Fortunately, Winston is forecast to make another sharp turn in the week ahead, but the cyclone should stay far enough west to spare Tonga for a third impact. It's the question on the minds of so many. In El Niño years, South Pacific tropical cyclone activity tends to be greater toward the International Date Line, rather than in the Coral Sea near Australia. While sea-surface temperatures are not the "end-all-be-all" for tropical cyclones, warmer-than-average waters in the South Pacific no doubt helped fuel Winston.